The Declaration of Independence, Constitution, and Bill of Rights are the founding documents of the United States. They are important to Criminal Justice Professionals for several reasons. 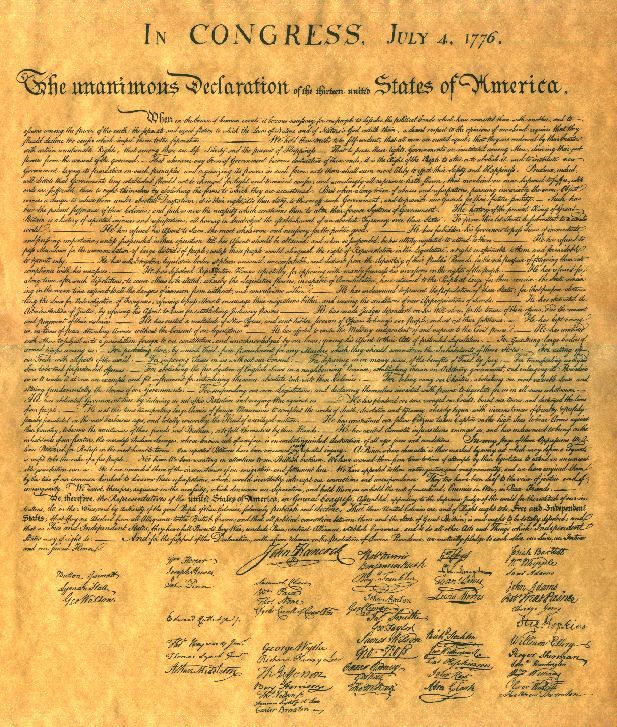 The Declaration of Independence technically has no legal standing, however it provides an insight into the setting of the establishment of the United States as a sovereign country. It's jurisprudence reflects in a very strong degree of the thinking of John Locke and his 2nd Treatise on Civil Government as a revolutionary document laying the claims to legally create a sovereign territory against a sitting Monarch with the use of force if necessary (Locke 1690). The implications of the Social Contract Theory and who has the right to use force to secure the homeland and it's citizens is a very powerful statement in the Declaration of Independence affecting modern code enforcement. The Constitution technically is the framework of the American Government. The Constitution enshrines a Republican and Federalist form of governance. The Republican model is the establishing of a strong national government that in turn gives rights to the states. Federalism establishes the three executive branches: 1. presidency 2. legislature 3. judiciary. This is a very prime concern for Criminal Justice Professionals and homeland security officers. The establishing of the Supreme Court as original jurisdiction for ambassadors and treaties, the final arbitrator on law, and cases has a direct impact on all working policemen. This final appellative branch has shaped Criminal Justice Procedures from Marbury v. Madison towards defining the rights of foreign fighters who were secured by our military; which concern police powers and interrogation (del Carmen 2010). The Declaration of Independence is a manifesto styled as a complaint to the British King George III. It gives a statement to the conditions causing the states to sever themselves from the Crown in the introduction. Jefferson surmises, "We hold these truths to be self evident, that all men are created equal, that they are endowed by their Creator with certain unalienable rights, that among these are life, liberty and the pursuit of happiness" (Declaration of Independence). Jefferson also alludes to evil, a concept that forms the concepts of mens rea, actus rea and mala in se (del Carmen 2010). The body develops what course of remedy the colonies attempted but more importantly stated in the conclusion that "these United Colonies are, and of Right ought to be Free and Independent States; that they are Absolved from all Allegiance to the British Crown, and that all political connection between them and the State of Great Britain, is and ought to be totally dissolved" (Declaration of Independence). So ends the exposition and begins the development of the legal documents that would come to frame the United States and subsequently affect modern Criminal Justice to the present day. There are two policy models derived from language and concepts within the Declaration of Independence and are dividing Criminal Justice: 1. The Crime Control Model (conservative) 2. Due Process Model (liberal) (Nowlin). The CCM focuses on protecting citizens rights as life, liberty, and the pursuit of happiness from criminals. This is a managemental model concerned with processing, conviction, and disposition of cases (Nowlin). The DPM also is concerned with statements as life, liberty, and the pursuit of happiness however it is focused on limiting governmental influence and protecting the defendant's human dignity and rights. It is more adversarial and judicial than the managerial model (Nowlin). The Constitution is a source of law. It's construction is reflected by state constitutions at a lower level. Art. VI, cl. 2 of the Constitution states: "This Constitution, and the Laws of the United States which shall be made in Pursuance thereof; and all Treaties made, or which shall be made, under the Authority of the United States, shalt be the supreme Law of the Land..."(del Carmen 2010). Only one crime is mentioned in the United States Constitution and it is Treason (del Carmen 2010). Treason against the United States consists in levying war against them, or in adhering to their enemies, giving the latter aid and comfort. No person can be convicted of treason except upon the testimony of two witnesses to the same overt act or on confession in open court (Art. III, sec. 3, cl. 1). At the Constitutional Convention on May 25, 1787 in Philadelphia, different ideas were brought fourth to replace the Articles of Confederation. This activity was lead by John Madison. So Madison is considered the Father of the Constitution. George Washington was unanimously elected it's president. Within the competing Virginia, New Jersey, and Hamiltonian Plan, the ownership of slavery was maintained and was the first serious error of the United States system of laws. The Virginia Plan lead by Edmund Randolph contained a strong central government with checks and balances. The New Jersey Plan was concerned with revenue, taxation, the ratifying of treaties, and was defeated. Hamilton's model championed the British and provided a head of state for life. On July 12, Oliver Ellsworth proposed that representation in what would become the House of Representatives, stated that such be based on the number of free persons and three fifths of "all other persons", or slaves; the delegates compromised the following week agreeing that direct taxation be based on the white inhabitants and three fifths of the "other people" (A More Perfect Union). This is the most critical error made in the Constitution. The ratification of the Constitution split the states into two sides, the Federalists who supported the Constitution and the anti Federalists who opposed it. Alexander Hamilton's series of essays emerged as what we now study as the Federalists Papers. The strongest argument by the anti Federalists was the Constitution was an aristocratic document and it's paucity demonstrated weakness. What was needed was a Bill of Rights in which the people could plainly see the boundaries between the state and the people (A More Perfect Union). The Bill of Rights are the first Ten Amendments and grants citizens substantive rights (Bloom). Due process and equal protection are two of the most important concepts in Criminal Procedure. The Constitution creates a citizen first then a president. In continuation, primary and secondary law emerge. The rights of the citizen are considered primary law. The sworn duty bound obligations of code enforcement are secondary law. Hence police officers are citizens first and sworn duty bound officers second. When the de facto interests of the police are placed in front of the right of citizens a totalitarian situation exists (De Shon 2000). The First Amendment concerns the Right to think and move about freely, worship the faith of your choice, and confront the government (del Carmen 2010). The Fourth Amendment provides that one may remain secure in one's person and things. It is considered the most important amendment in policing (del Carmen 2010). The fifth amendment provides that no one may be prosecuted for capital or infamous crimes unless on a presentment or indictment of a grand jury. There shall be no ex post facto laws. Double jeopardy is prohibited. No one can be compelled to be a witness against oneself. Due process prohibits the loss of life, limb, and property (del Carmen 2010). The Sixth Amendment is very important to Criminal Justice. Such provides for a fair, speedy, and impartial trial. It also guarantees the right to confront witnesses and evidence in the local district where the crime occurred and be provided with legal counsel to assist in one's defense (del Carmen 2010). Criminal Justice Professionals in the modern era must view the construction of the Declaration of Independence, Constitution, and Bill of Rights in a deliberate manner (Principles of Constitutional Construction). Their substance reflects a very deep history of jurisprudence and points of law contained in the Anglo Saxon law which has given rise to concepts in modern Criminal Procedure as the Crime Control Model and the Due Process Model (Nowlin). Laws, rights, and duties help ordinate the citizen to one's end in the state. The Social Contract between the government and it's people define what rights, punishments, and processes are licit to be upheld or used against one. These federal documents empower the states and lower jurisdictions giving them legitimacy. This concept of equal protection and due process is sanctioned by the state making a sworn officer the legal agent to make an intervention in one's freedom with probable cause (del Carmen 2010). The records discussed here and their jurisprudence have come to shape and form some of the most profound cases in law, the modern Department of Homeland Security, and Criminal Procedures in this country and around the world.